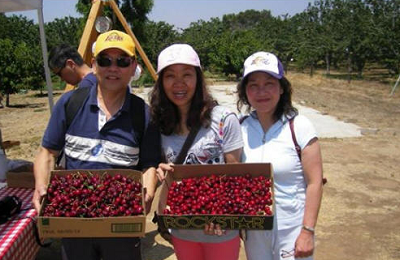 Riverside County, California Riverside County, California U-Pick farms: Find a pick your own farm near you in Riverside County, California for fruit, vegetables, pumpkins, organic foods,local produce and more! 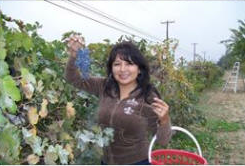 Looking for a local, pick-your-own farm in Riverside County, California? Scroll down this page and you will see the U-Pick farms in Riverside County, California, sorted by county. Those that offer organic or sustainably grown produce are identified by the words "organic" and/or "sustainable" in Green, next to their name (see "What does Organic mean?"). The U-pick crops they offer follow the name of the farm. To search the page for a specific crop, use Ctrl-F (or on an ipad or Mac, use their "search on this page" function) If they have a website, the name will be in blue and underlined; click on it and it will open their website. If you find anything outdated or inaccurate, see the customer and farmer menus (as appropriate) at the top menu bar to submit updates and corrections and help me keep each current! 2308 Washington Street, Riverside, CA 92506. Phone: 626-688-4306. Alternate Phone: 626-589-7337. Email: [email protected]. Open: Click here for current open hours, days and dates. Directions: Click here for a map and directions. We are certified organic for all crops! Payment: Cash, only. 49575 Dove Drive, Aguanga, CA 92536. Phone: 562-912-2748. Email: [email protected]. Open: Does anyone have current information, are they still offering pick your own or are even open? If so, please write me, their last reported hours were You May come anytime, please call first, or Email me for a desired time. Directions: When you are ready to come email me and I will send you a map. Do not trust internet mapping services or GPS as roads they think are here are not. Click here for a map and directions. I grow selected vegetables, melons, and herbs year round. We use natural practices, but are not seeking organic certification. Payment: Cash, only. I have 4 very large shade houses and 7 greenhouses which are available for rent if you want to grow your own produce. I will provide water and advise and maintain your crops for you. 10923 Cherry Avenue, Cherry Valley, CA 92223. Open: UPDATE 2018: We are sad to announce that we will no longer be opening our cherry orchard. With the continuing warmer than normal winters and lower than normal rain fall, the impact to the health and harvest of the cherry trees has been substantial to where we will no longer be able to open for business. We are so very thankful to all of you who have provided us your support and visited our orchard over the years.. Click here for our Facebook page. 39700 Cantrell Rd, Temecula, CA 92591. Phone: 951 225-5552. Email: [email protected]. Open: opening for the Season at the beginning of May, from 8 am to 6 pm, 7 days a week through the first week in July. Click here for current open hours, days and dates. Picking updates: Click here for picking updates. Directions: From I-15- head east on Rancho California Road Turn left at Butterfield Stage Road Turn left on La Serena. Turn right on Walcott. After one mile, Walcott turns into Cantrell Road Continue straight and follow the signs to the Farm. Click here for a map and directions. Friday Night Movies at the farm; Every Friday night in June at 8pm Blueberry Bread on Monday mornings at 10:30 Nana's Storytime every Tuesday Morning at 9:00 and 10:30. Payment: Cash, Check. Click here for our Facebook page. .
A visitor writes on May 26, 2017: "It is always fun to pick blueberries and I love the farm. children are always having fun and its good to see the animals too. I always look to your website to see what is in season." 45-751 Aladdin Street, Indio, CA. Phone: 760-347-2494. Open: February through May, on Sunday and Monday only, 9am to 3pm. Directions: Call for directions. Payment: Cash, only. Comments from a visitor on February 22, 2011: "This is a family run farm where you can go into the orchards and pick your own grapefruit, pink and white, lemons, tangeloes and oranges. Nothing fancy, just the best tasting citrus ever at reasonable prices. Sold by the pound. I paid 20 cents a pound for the sweetest pink grapefriuts ever. Bring your own containers. They supply long picking poles. A little hard to find but well worth it. " 4800 Crestmore Road, Rubidoux, CA 92509. Phone: 213-268-0455. Email: [email protected]. Open: 7 days a week 9 am to 5; please call ahead for appointment. Directions: Corner of Crestmore and Loring Ranch Road. Click here for a map and directions. We are certified organic for all crops! Payment: Cash, only. Before you go, call to verify that they are still offering U-pick, they have no active web presence.